Disclaimer: this story is not for the squeamish. 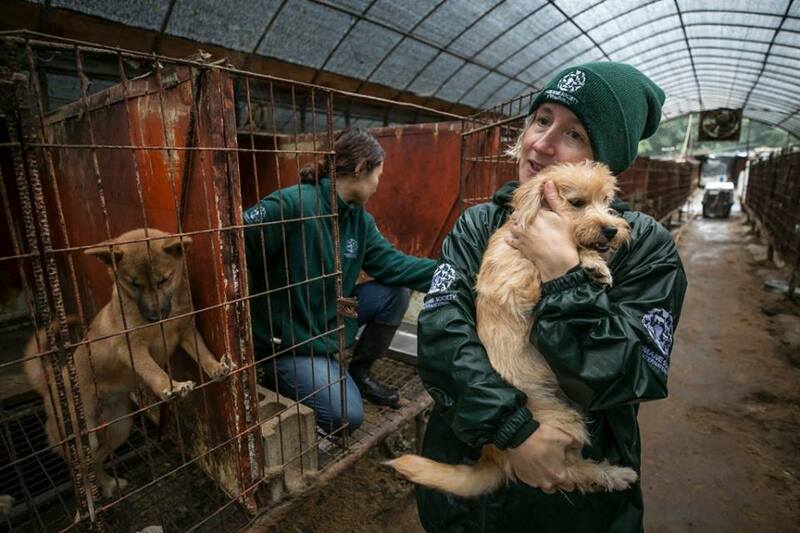 Earlier this month, Humane Society International completed a months-long rescue of 200 dogs from a South Korean dog meat farm. Dog meat soup is thought to enhance male virility in South Korea. Others prefer the dish for its "health benefits" and consider it a traditional specialty. Younger generations of Koreans, though, are working to stop the dog meat trade by boycotting, protesting, and disrupting daily operations. In the latest of several such attempts, Humane Society International (HSI) assisted a Korean farmer to leave the dog farming industry by converting to an organic pepper and medicinal herb farm. HSI negotiated the purchase of his remaining dogs and the distribution of them to waiting humane societies across the U.S., Canada, and Europe for adoption. 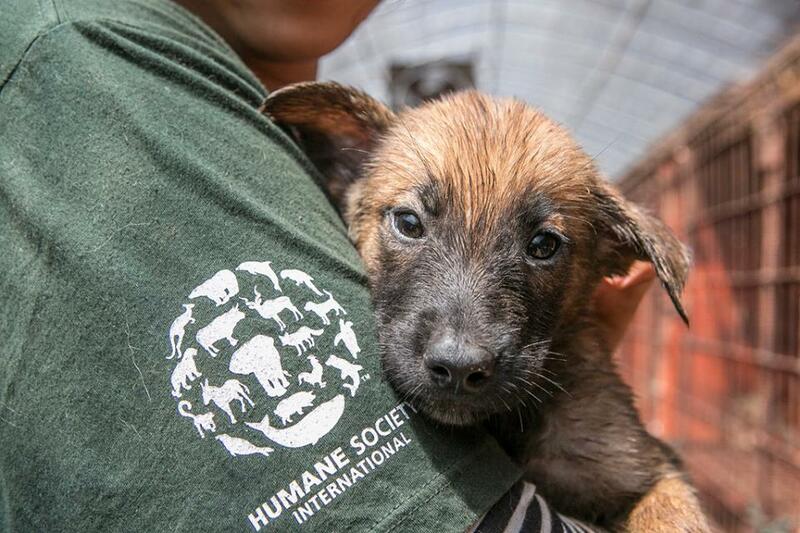 Local news stations all over the country were announcing the U.S. arrival of these rescued dogs along with details of the operation. This weekend, I headed up to Hagerstown, husband and our dog Charlie in tow, to see if I could photograph the dogs that they received, for this article. The Humane Society of Washington County in Hagerstown is a beautiful, light-filled facility. It was bustling with activity, from people dropping off dog food donations to families meeting cats and dogs in play areas. To our astonishment, though they had just been made available two days prior, all but one of the Korean rescue dogs had been adopted by that Saturday morning. They brought out the last puppy, Harper, for me to feature in my pictures. As we talked about the rescue and the overwhelming public response, Harper slowly came out from behind her handler. Everything startled her; each swish of the automatic doors would send her scurrying behind the volunteer again. "These dogs were very unsocialized, raised in cages outdoors for their whole lives," explained Noel Fridgen, Communications and Digital Fundraising Manager for the Humane Society of Washington County. "Anyone who adopts one needs to understand where they came from and that humans were something to be feared. These dogs are going to have to learn how to be a pet and that humans can be trusted -- trusted to feed them, to love them, and to take care of them. They will need help acclimating to strangers, both human and other pets, in addition to walking on a leash and housetraining." If you're interested in adopting one of these rescued puppies or dogs, check with your local humane society and media outlets. There is no central list of where all of the dogs ended up. In Virginia, Charlottesville-Albermarle SPCA received 5 dogs, and Lost Dog and Cat Rescue of Falls Church received several dogs as well. To be honest, they're getting adopted very quickly, so call soon. Don't go look for one at the Humane Society of Washington County in Hagerstown, though: Harper came home with us. We have renamed her Hachi, short for "gachi issneun," which means "worthy" in Korean. You'll be happy to hear that she's settling in nicely at her Woodbridge home. 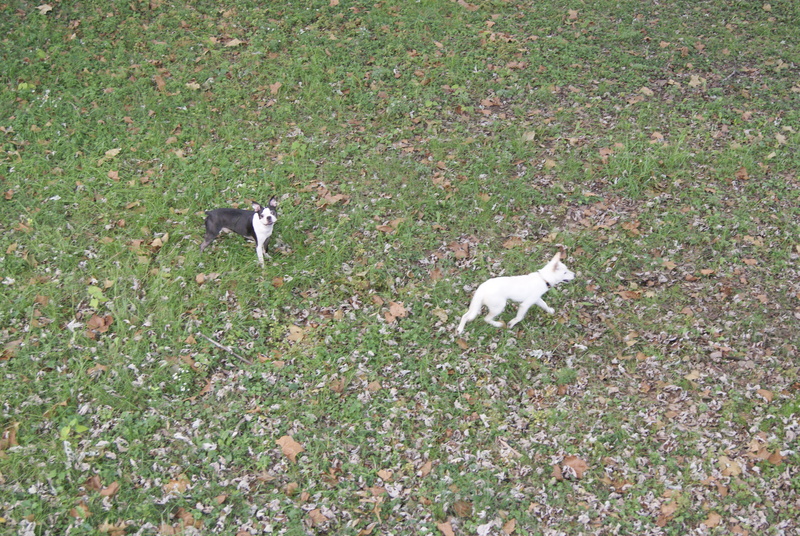 She especially likes running around the grassy yard with Charlie and giving him lots of kisses. Stairs were the hardest thing for her to get used to, but with the help of some treats, it's only taken her a day to master them. To learn more about the Humane Society International efforts to shut down dog farms, visit their Facebook page. Have you adopted a rescued dog? Tell us all about it in the comments below! Live in the D.C. area? Here are three off-leash dog parks your dog will love.